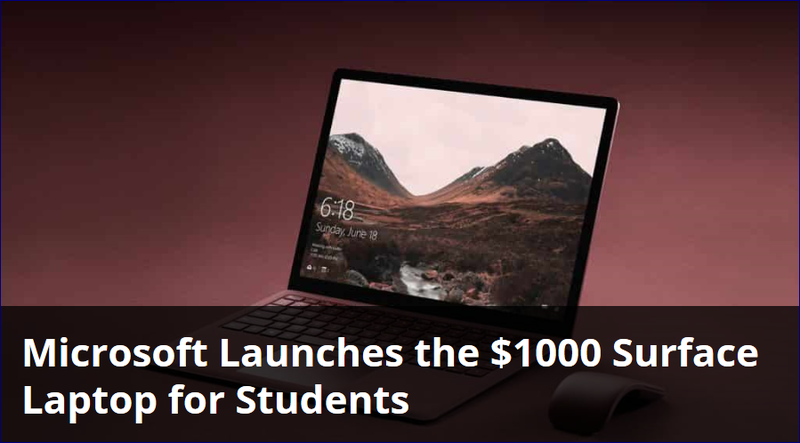 Microsoft Launches the $1000 Surface Laptop for Students - Something New Everyday! Following up on the announcement of the Windows 10 S, Microsoft revealed an all new Surface Laptop to go along with it. It's hard to tell what folks at Microsoft were thinking when working on the Surface Laptop. The $999 device is marketed as a "for school" laptop competing against Chromebooks; which is ironic considering that Chromebooks go for around $200. What's more, it runs on Windows 10 S only, further limiting its use case and target audience. This isn't the first time Microsoft tried something like this, the first Surface tablets ran Windows RT, a barebones version of Windows 8. There are major limitations in Windows 10 S. You won't be able to download and run any program on your $1000 Surface Laptop for example. The Redmond company is adapting the Surface strategy with the Laptop as well. What Microsoft does is that it releases an in-house device with top of the line specifications and features. The OEMs then follow suit with their own take on the device (HP Spectre x360, Acer Switch for example). This seems to be the case with the Surface Laptop as partner OEMs already have laptops starting at $189 made for students. On the spec sheet, the Surface Laptop features a 3:2, 2,256 x 1,504px resolution and 13.5-inch touchscreen display. The keyboard (and most of the area around the keyboard) is covered in Alcantara, a suede-like material (also found on the Surface Pro 4). You get a conventional USB 3.0 port, a mini DisplayPort, and a Surface power connector. There is no USB type-C slot on the Surface Laptop. It weighs in at 1.25 KG. The $999 version will get you an i5 (7200U), 4GB of RAM and a 128GB SSD. Top of the line model of the Laptop will come with an i7, 16GB RAM, 512GB SSD and will cost $2,200. According to the head of the Surface department at Microsoft, Panos Panay, the Surface Laptop is faster than a MacBook Pro and lighter than a MacBook Air. Pre-orders are open, the Surface Laptop starts shipping from June 15th.